One of the most common reasons that patients visit doctors every year is because of ear infections. Some are external infections (“Swimmer’s ear”), while most are deeper infections (“Otitis Media”) located behind the eardrum in a space called the “middle ear”. Otitis media is the most frequent illness of childhood. In fact, one third of all children have more than three ear infections during the first three years of life. 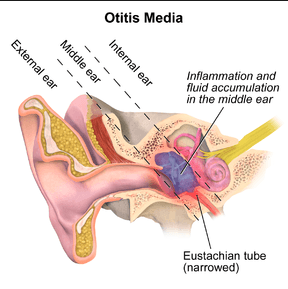 Although most common in childhood, otitis media does occasionally occur in adults. The eustachian tube is a narrow channel which connects the back of the nose to the middle ear. This tube normally acts to allow air into the middle ear, an important factor in normal ear function and hearing. However, when the eustachian tube does not work properly because of a cold, sore throat, sinus infection, allergies, or enlarged adenoids, bacteria from the nose and throat can enter the middle ear and cause an infection. The treatment for otitis media consists of oral antibiotics. Surgery is necessary when there are continued infections despite antibiotics or if fluid persists in the middle ear even though the infection is gone. The most common surgical procedure for recurrent otitis media is myringotomy (also called tympanostomy) with insertion of pressure equalizing tubes. This improves hearing and bypasses the poorly functioning eustachian tube. The important point to remember is that with prompt and proper treatment ear infections can be treated successfully and serious complications can be avoided.